Scott Snyder and Brad Glosserman are co-authors of The Japan-South Korea Identity Clash: East Asian Security and the United States. Anniversaries loom large in international relations. They are opportunities to shape historical narratives. This is especially so in relations between Japan and South Korea, where anniversaries commemorating dark moments in history abound. It is particularly disappointing when opportunities are missed to commemorate positive developments, such as the 20th anniversary of the Obuchi-Kim summit that held out the prospect of a new partnership between Japan and South Korea. 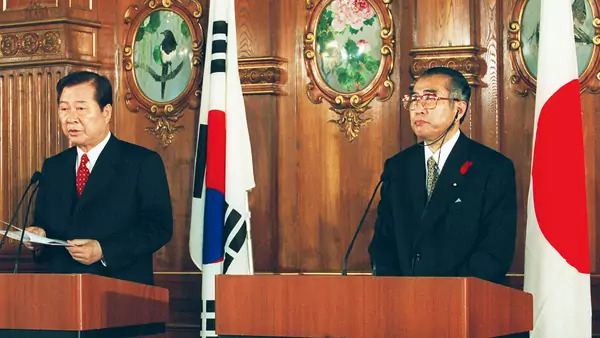 Indeed, the 20th anniversary of the Obuchi-Kim summit may have been overlooked precisely because it was a sobering reminder of missed opportunities and the fraught nature of the Japan-South Korea relationship, one that despite great promise remains a captive of the past. It is an equally powerful symbol of the peril of focusing on history rather than the future. The two men recognized the convergence of their respective national interests and their desire to work together to build a mutually beneficial future. They pledged to cooperate on issues of national security and economics, and to promote personnel and cultural exchanges, especially among the young generation. Their joint declaration was an extraordinary document, a blueprint that if followed would transform East Asian political dynamics. Unfortunately, its ambitions proved too great and politicians in both countries proved unable to resist the siren song of nationalism when domestic politics provided an opportunity to play the history card. As a result, this October, rather than celebrating the 20th anniversary of the joint declaration, the two countries were contemplating the incipient collapse of the December 2015 Comfort Women Agreement, a deal struck by the government of President Park Geun-hye and Japanese Prime Minister Abe Shinzo. The agreement survived formal review by the administration of President Moon Jae-in, which inherited it after Park was impeached. Even though Moon called it “seriously flawed,” his government conceded that the deal had been agreed upon by both countries and therefore would not demand renegotiation. Seoul continued to pick at the arrangement, however, and decided to unilaterally dismantle the Japanese-funded foundation it created to provide support to comfort women and their families; that funding stream would be replaced by Korean resources. This decision reflected no small irony. Korea had for many years rejected the Asian Women's Fund – the nongovernment mechanism set up by Tokyo in the 1990s to provide compensation to the comfort women – as an unacceptable proxy for an admission of responsibility by the Japanese government precisely because it did not provide direct funding to redress the harms done to the comfort women. The deal is also threatened by the comfort woman statues erected by nonprofit groups in Busan in front of the Japanese consulate there, in addition to the comfort women statue that stands in front of the site of the Japanese embassy in Seoul. Under the December 2015 agreement, Seoul said it “will strive to solve this issue in an appropriate manner through taking measures such as consulting with related organizations about possible ways of addressing this issue.” But the Moon administration has allowed nongovernmental activists to take actions that have instead intensified the standoff. A South Korean court ruling earlier this week that the 1965 Japan-Republic of Korea normalization treaty does not protect Japanese firms from claims by individuals for compensation for forced labor will further complicate the Japan-South Korea relationship. Such actions reject the “future-oriented perspective” of the Kim-Obuchi agreement signed two decades ago (and the December 2015 Comfort Women Agreement) and reinforce domestic influences over the Japan-Korea relationship that paralyze its progress. Moon and Abe should instead work to free the relationship from domestic politics through a fundamental transformation of political dynamics between the two nations. One way of doing so is laid out in our 2015 book, The Japan-South Korea Identity Clash, where we proposed a "go bold" strategy by which Japanese and South Korean leaders would embrace statesmanship by addressing core issues in the relationship, building on the spirit of the Kim-Obuchi declaration. Our recommendations included the establishment of a joint holiday to mark Japan-South Korea reconciliation, effective efforts to bring finality to the comfort woman issue, and Japan's abandonment of its claim to Korean-controlled islands that South Koreans view as reminders of Japanese imperialism. Those efforts would help transform the bilateral relationship and allow both countries to jointly address shared security concerns through cooperation based on common values. Achieving this goal, however, is only possible if both leaderships return to the approach embodied in the Kim-Obuchi declaration. The question, more potent than ever in an age of competing nationalisms, is whether Moon and Abe can muster the political will to swim against the tide in pursuit of an outcome that would materially benefit the national interests and bring a measure of finality to the historical demons that have beset both sides. Such efforts will become even more important in light of intensifying security challenges both countries will likely face in the future.